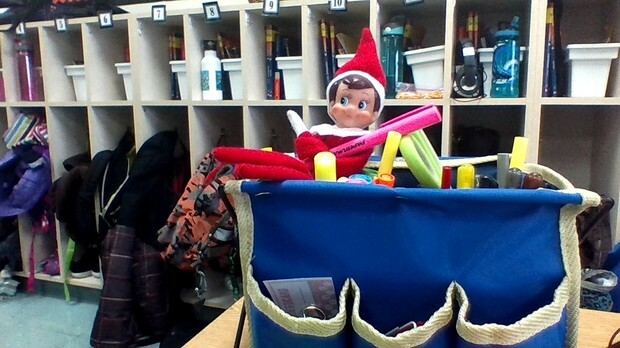 This is Candy Cane our elf on the shelf. He is all wrapped up with the marker he is very silly.Yesterday he was holding an earser. He is a cute elf too! In class we are reading Humphrey the hamster also Fish In the Tree but we read during Daily 5. 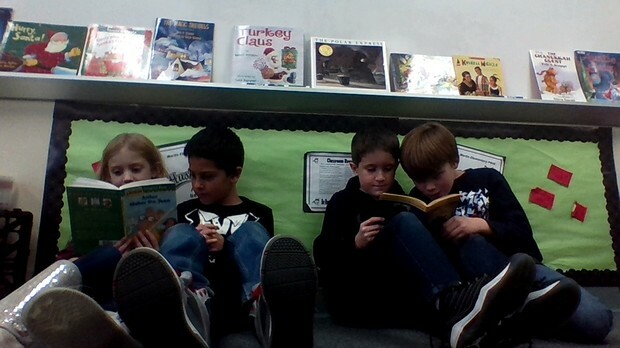 These four are reading to each other. Sal and Noelle are reading to each other and Jacob and Logan are reading to each other. In math we are learning multiplication we have a few rhymes. I will tell you a few. 7 and 7 were out of line until they became 49. 9 and 7 is the key to open locker 63. 8 and 9 made a heavenly stew it could serve 72. 9 and 9 Katie spun soon came up as 81. 6 and 8 went on a date when they came back they were 48. 6 and 6 licked Popsicle sticks until they turned 36. 8 and 8 went to the store to by Nintendo 64. These are some of our rhymes. In PE we were playing moon ball this week and cards. In moon ball you cannot get hit by a ball. If you get hit by a ball then you have to go to the other team's moon. A blue or gray ball that you throw to a teammate and if they catch it then your whole team can go back. If you throw a yellow ball and your teammate catches it then that member only comes back and the others do not. 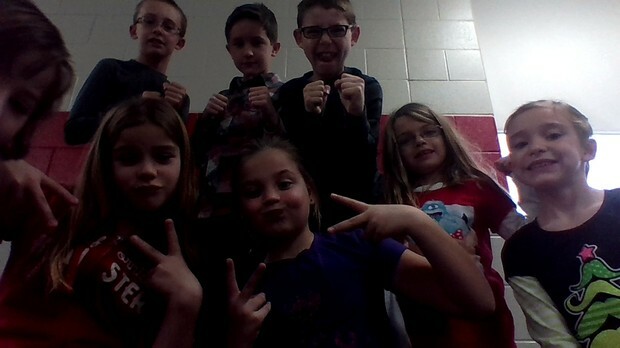 On Tuesday in Music we sang some sing-a-longs. I will tell you some of the songs. We sang Silver Bells, Frosty the Snowman, Jingle bells, and Jingle bell rock. Those are some of the songs.